From the Greenpeace site a little bit of irony. Kimberley Clarke is using Wall*E a character from the Pixar movie about conservation to sell Kleenex, a product that uses virgin trees and nothing recycled. Of course, the irony is somewhat short lived when you realize that Pixar/Disney must have given their permission to KC to use the Wall*E image in the first place. Ahhh the mighty dollar. Click here to watch the movie and here to tell Kimberly Clarke what you think. 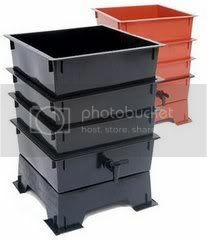 In an effort to stop the 25% of table scraps that end up in Los Angeles area landfills, LA residents are getting these cool little green bins to keep in their kitchens. Food scraps and leftovers go in the mini bin and then out to the big green bin making it easier, and hopefully more doable. Way to go LA! This goes back about a month but I'm just now getting caught up. A pretty good little piece with the exception that my hair looks like I just woke up. Such is life. As some may have noticed I just back posted about two weeks of garbage after being silent for a bit. I was on vacation back east with my family and didn't have a ton of internet access (very frustrating) but did manage to save everything i could and bring it back with me. A lot of stuff that I'll hopefully be able to post on in the next few days, but here now are a few tidbits I can think of. It was very interesting for me to look back and see what waste I (and the girls) generated over the past two weeks and why. It was concrete evidence that limiting waste is relatively easy once you get the hang of it and are in your routine, but the second you step out of that environment, it's a whole new ballgame. For instance, as a guest in my inlaws and parents house, I can't really tell them what to buy and what not to buy and therefore i had a bunch of things I'd never buy - bags of celery, egg white cartons, 2 coffee bean bags, etc. Kind of fascinating to be thrown back into how bad things can be (not that they are that bad, but it's just different). We flew on a red eye and when i got in I bought a cup of coffee as i had a drive ahead of me. The lady behind the counter refused to take my coffee mug saying it was against airport policy. Since I needed the jolt for the drive, I accepted, poured the coffee into my mug, and put the cup in the side mesh pocket of my bag - what a waste. As i was exiting the airport, I asked another vendor if they could fill my mug up and she had no problem with it. Just goes to show you huh! As far as the worms and food scraps, i thought long and hard what to do and finally came up with a good solution. Part of the time we were out in the woods (went camping one night with the girls and I bet you can guess which night by the waste we generated) so while we were there, i took each days worm scraps and walked into the woods where I dug a small hole and buried the compostables. Sort of using nature for natures sake. The second half of our trip which was a little more suburban was handled the same way except I spread the stuff out under bushes (burying it still) in my moms garden. As for garbage and recycling, well I had a bag full and almost had to pay extra (oh the irony) but figured out how to fit the bag it was all in into another bag. More to come on recycling back east and the Museum of Trash! Yet Another Plastic Bag Solution - Furoshiki!!!! For more tips, check out this site as well! Check this out. Sheila from the Isle of Wight England who read a couple of my Care2 articles sent me some information on a project called Morsbags. The basic idea is that local groups/individuals get together into groups called pods and make re-usable bags from whatever material they happen to have around. The bags are then given to local folks who in turn are asked not to use any more plastic bags. The website is set up really easily and you can download pdfs to help you get started on making bags right away. The general idea is to get together with a group of friends, make as many bags as you feel like and then give them away to be used. They suggest going to a shopping center and passing them out en masse to make a better statement but also recognize that this isn't for everyone. Sheila also includes a piece of paper in each bag explaining what they are and how to make them. The thing i really love about the site is that they are just trying to get people to change their attitudes and giving them a very concrete way to do it. I'm hoping to do an interview with the founder and will post that when it happens. By the way, the website for what Sheila's town has been doing is here. In the meantime, check out the site and get bag making! NOTE: Plane tickets and all plane related materials were for the entire trip which we have returned from.